In the spirit of Father’s Day, it’s only fitting to shed some light on the politics of Black hair from a man’s perspective. Today, I came across this great read, “Why I cut off my Locs and the politics of Black Hair”, by Rad Dockery, in which he shares the historical, spiritual, and political considerations connected with his decision to grow, and then later cut, his locs. On Father’s Day, I posted a picture on my Facebook profile of my daughter and myself. 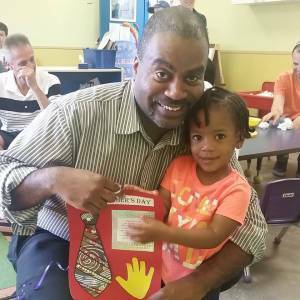 At her daycare, they were having a small father’s day celebration where the toddlers designed a gift for Dad. Well this led to my Facebook inbox blowing up. Not only due to the fact that my daughter is beautiful (yes I am very biased) – but due to the fact that I removed my locs. All of the sudden, I am getting offers to attend various churches. The assumption there is that I did this for religious reasons and that I am no longer an ‘evil’ rastaman. On the other side, there are some who now believe that I am no longer interested in the forward progression of the Black community in Toronto because I cut of my locs. Or in other words, “I am conforming to White Supremacy”. Boy, are we beautiful! Reflections on the 1st Natural Hair Congress Canada! Hi Ndija -excellent tribute to your Dad. Well done.